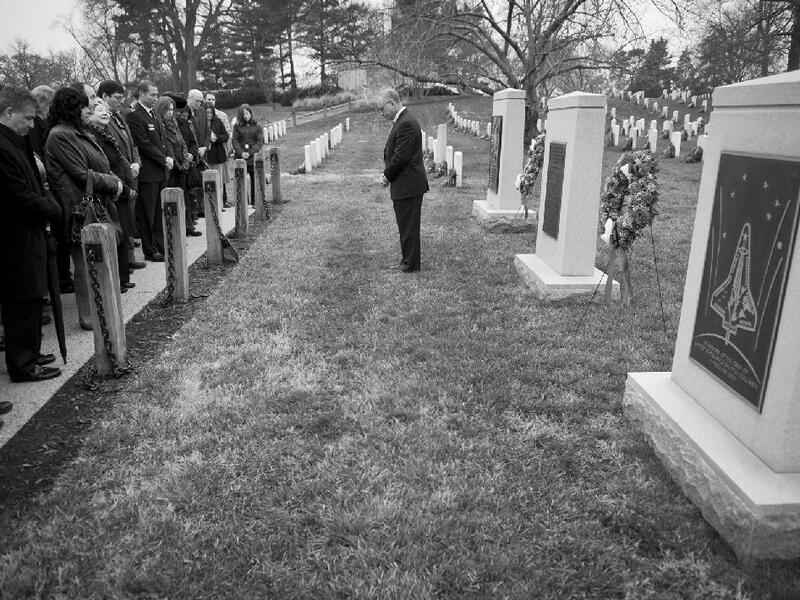 David Martinez-Delgado (MPIA, IAC), et al. 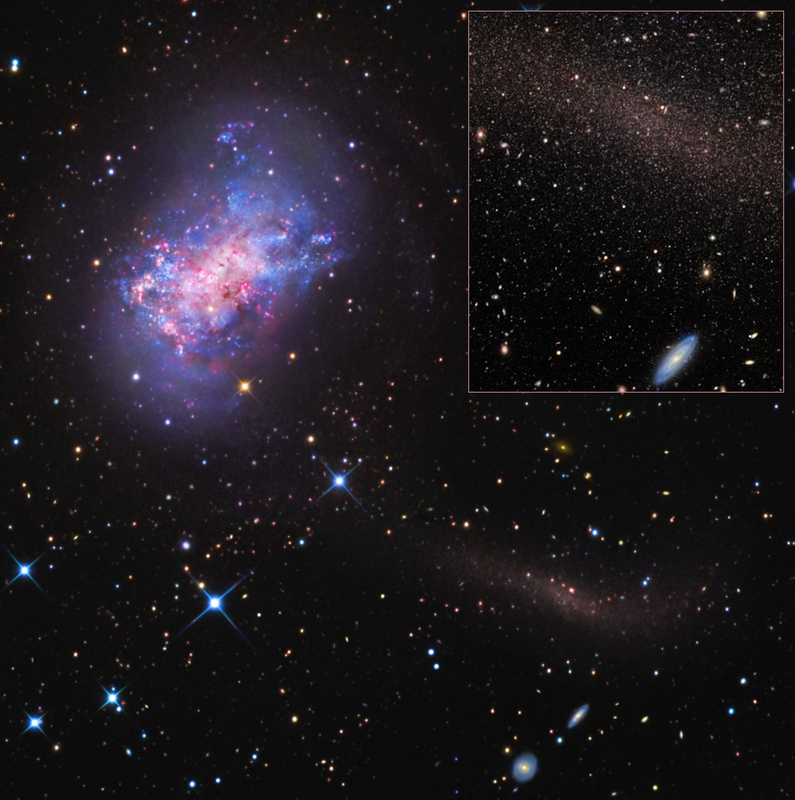 A mere 12.5 million light-years from Earth, irregular dwarf galaxy NGC 4449 lies within the confines of Canes Venatici, the constellation of the Hunting Dogs. About the size of our Milky Way’s satellite galaxy the Large Magellanic Cloud, NGC 4449 is undergoing an intense episode of star formation, evidenced by its wealth of young blue star clusters, pinkish star forming regions, and obscuring dust clouds in this deep color portrait. It also holds the distinction of being the first dwarf galaxy with an identified tidal star stream, faintly seen at the lower right. 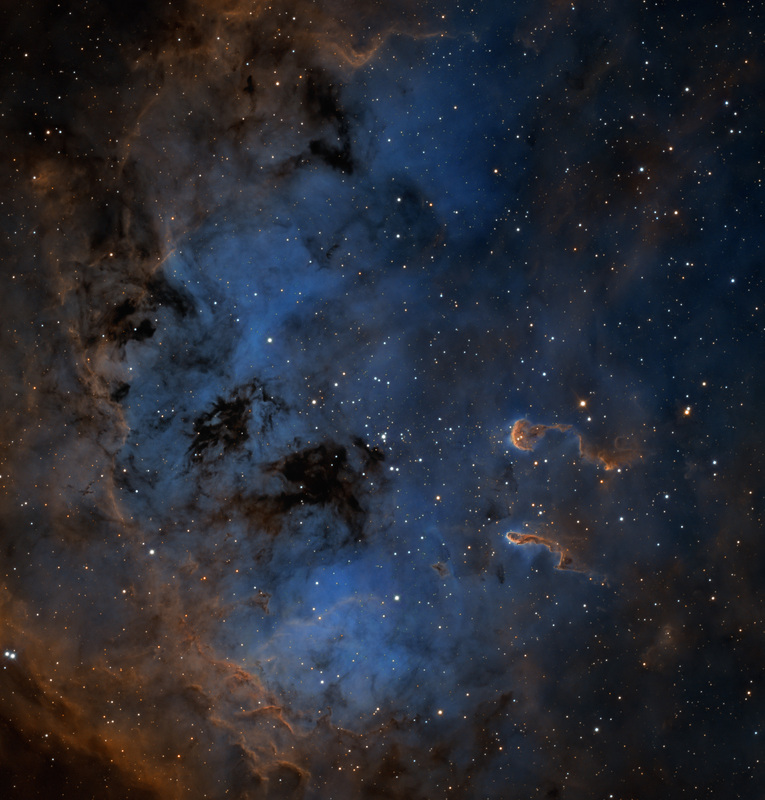 Placing your cursor over the image reveals an inset of the stream resolved into red giant stars. 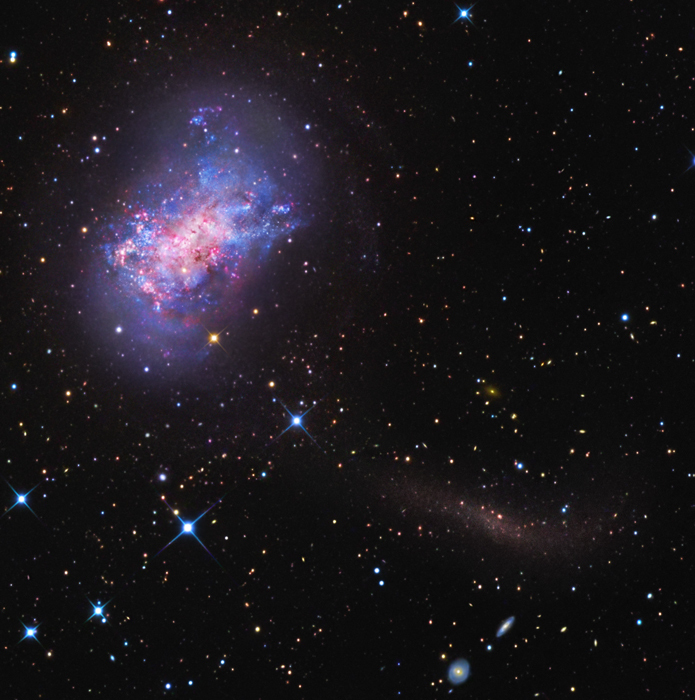 The star stream represents the remains of a still smaller infalling satellite galaxy, disrupted by gravitational forces and destined to merge with NGC 4449. With relatively few stars, small galaxies are thought to possess extensive dark matter halos. But since dark matter interacts gravitationally, these observations offer a chance to examine the significant role of dark matter in galactic merger events. The interaction is likely responsible for NGC 4449’s burst of star formation and offers a tantalizing insight into how even small galaxies are assembled over time. Like a baby learning to walk, the Visible Infrared Imager Radiometer Suite (VIIRS) is slowly adjusting to its new space environment and is gradually taking steps toward full operations. VIIRS was launched on October 28, 2011, on the National Polar-orbiting Operational Environmental Satellite System Preparatory Project (NPP) satellite and produced its first image on November 21. 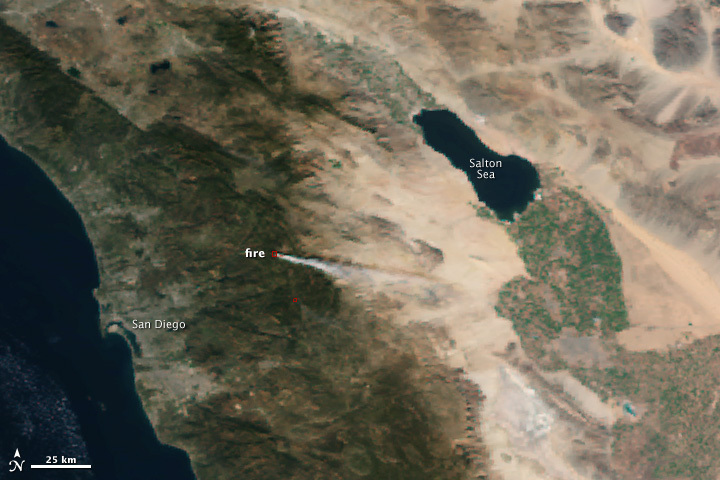 By January 19, 2012, the sensor acquired its first measurements of fires. These measurements and others from VIIRS are still preliminary, and scientists and engineers will continue testing and calibrating the measurements over the coming weeks before data are released for public use. It took longer to acquire the first VIIRS fire measurements because the sensor had to cool enough to accurately observe thermal infrared energy. These images show a few of the fires detected on January 19. The top image shows a smoky fire burning in the mountains east of San Diego, California. The images indicate that the VIIRS sensor is in good health and that it appears to be detecting fires accurately. In both images, the fire detections line up with plumes of smoke. In the South Sudan image, the fires are burning in areas where black, charred ground points to recent fire activity. 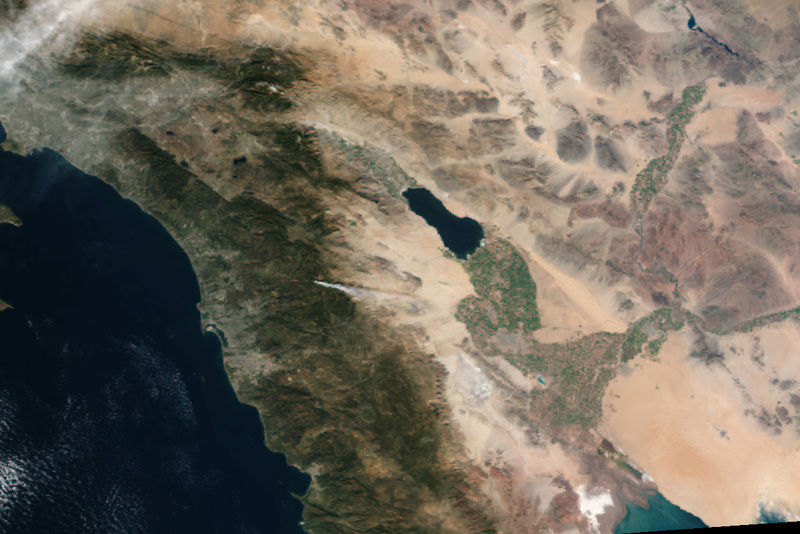 Flying over the same areas at about the same time, the Moderate Resolution Imaging Spectroradiometer (MODIS) on NASA’s Aqua satellite also detected fires in both California and South Sudan. It is vital that VIIRS makes these measurements because vegetation fires are one of the most important elements of land cover change and nutrient recycling in the Earth system. Fires play a major role in the formation and maintenance of numerous ecosystems. Over the last millennia, naturally occurring fires were gradually offset by those set by humans for hunting, land clearing and maintenance, and fuel production (charcoal). With the beginning of daily polar orbiting satellite data—which started in the early 1980s—and the routine monitoring of fire activity, it soon became clear that humans were quickly changing the natural fire regimes of large areas of the world. The fires have cascading effects on atmospheric composition (due to smoke) and alteration of climate conditions. Due to the widespread occurrence of fires, Earth satellites have become the primary resource for the monitoring of biomass burning and for timely information for fire managers and the science community. Ivan Csiszar, NOAA/NESDIS Center for Satellite Applications and Research, and Wilfrid Schroeder, University of Maryland Earth System Science Interdisciplinary Center. Caption by Holli Riebeek, Ivan Csiszar, and Wilfrid Schroeder. Kyrgyzstan is wedged in the mountainous wrinkles between Kazakhstan and China, created long ago when the land mass we now call India, propelled by plate tectonics, slammed into the Asian plate. Living there are a proud people with a rich history, surrounded by natural, high-altitude beauty. Out of numerous Kyrgyz lakes, one in particular stands out—Lake Issyk Kul. When seen from orbit, Issyk Kul appears to be a giant eye, looking at us looking down at it. The snow-covered mountains become aged eyebrows. The lake itself, having a fairly high salt concentration, does not typically freeze over, thus reflecting wintertime light in such a way as to form a “pupil” that seems to track us as we orbit overhead. This enhanced-color image shows sand dunes trapped in an impact crater in Noachis Terra, Mars. Dunes and sand ripples of various shapes and sizes display the natural beauty created by physical processes. The area covered in the image is about six-tenths of a mile (1 kilometer) across. 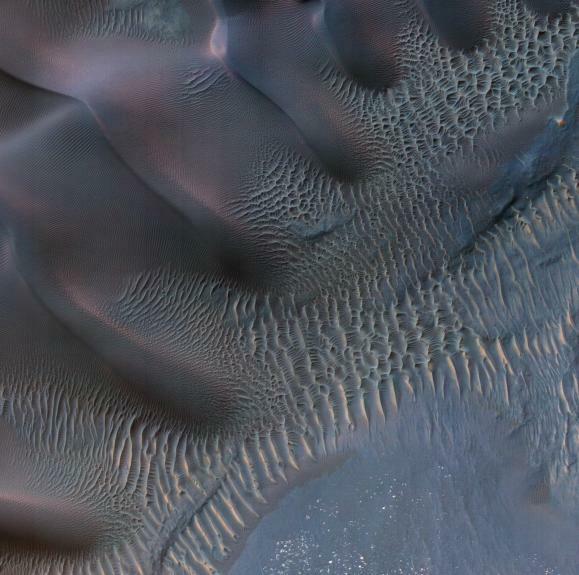 Sand dunes are among the most widespread wind-formed features on Mars. Their distribution and shapes are affected by changes in wind direction and wind strength. Patterns of dune erosion and deposition provide insight into the sedimentary history of the surrounding terrain. The image is one product from an observation by the High Resolution Imaging Science Experiment (HiRISE) camera taken on Nov. 29, 2011, at 42 degrees south latitude, 42 degrees east longitude. Other image products from the same observation are at http://www.uahirise.org/ESP_025042_1375. HiRISE is one of six instruments on NASA’s Mars Reconnaissance Orbiter. The University of Arizona, Tucson, operates the orbiter’s HiRISE camera, which was built by Ball Aerospace & Technologies Corp., Boulder, Colo. NASA’s Jet Propulsion Laboratory, a division of the California Institute of Technology in Pasadena, manages the Mars Reconnaissance Orbiter Project for the NASA Science Mission Directorate, Washington.